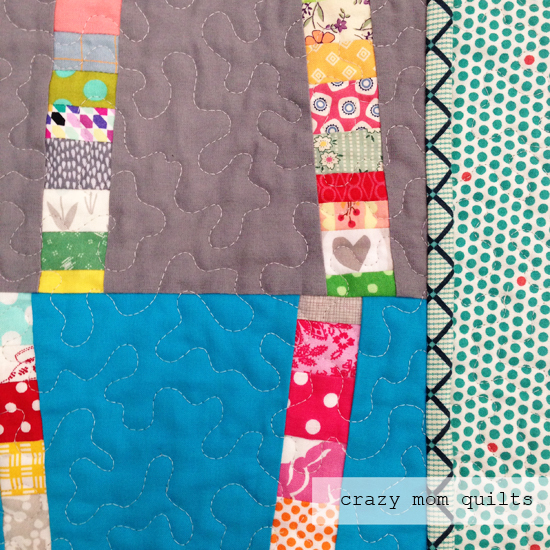 This pattern proves that every scrap deserves a chance! The blocks in this version finish a touch larger than 12" square. I paired strips of scraps with a variety of solids from my stash. There are so many tiny details in this quilt. One could sit and look at it for hours. 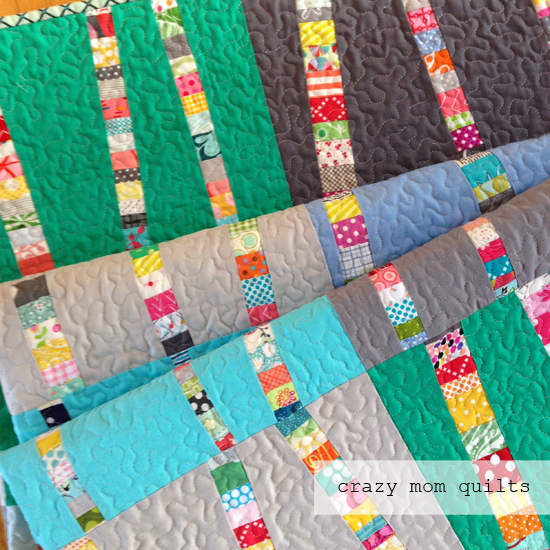 I love quilts like that! Did you notice the heart detail? I love little bits like that! The lattice print makes such a great binding! It's an old Denyse Schmidt print from JoAnn's. The polka dot backing was a gift from my friend Tara. I had just enough, so I figured it was meant to be. The quilt measures about 48" x 60". This is my 5th quilt finish for the year. AND.... it brings my WIP total down to 5! I'm extremely excited about that! Oh it's gorgeous - I think this is my favourite yet, I love that the background colours are slightly foresty, so you can imagine these brilliant bright trees popping up in a winter wood! 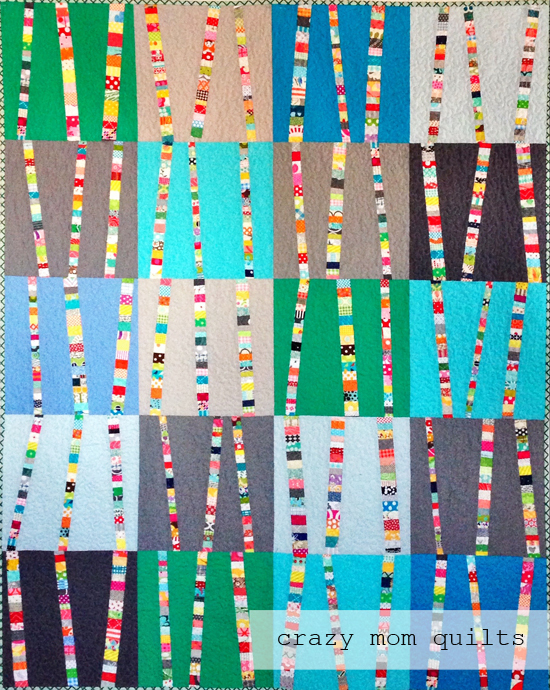 I just love your Birch Trees quilts. It's so simple, so brilliant, and so scrappy! The quilting adds wonderful texture to the quilt. Lovely. Absolutely loving the birch tree quilts. Thank you for hosting this linkup! Beautiful finish! I may have to make one similar. It's fun to see the same pattern made again and again. I love the background solids you chose for this one. Congrats on a beautiful finish! I have always loved this pattern. I was given this one by you a long while back (i think during an anniversary celebration?) and it is on my list. I love the simplicity of it and the overall effect. Great finish. Another beautiful version! This is such a great pattern. Loved making this quilt - I actually did a wall hanging size for our stair well. Great way to use up scraps. Thanks for the inspiration! Another lovely finish! I just remembered that I have that pattern from you. I think it's time to turn that pattern into a quilt!! 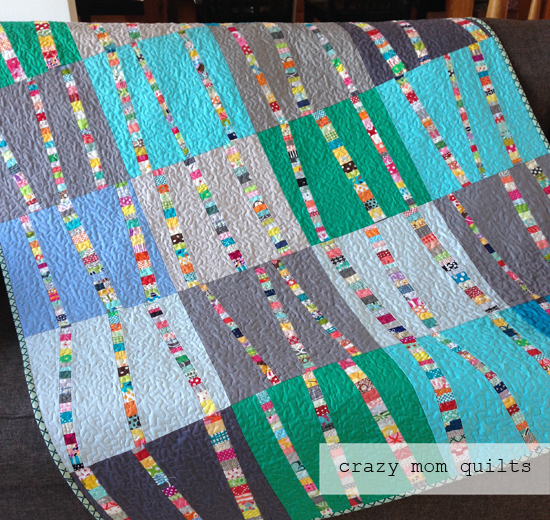 I love how you used small pieces of fabrics for this quilt. Looks awesome! I highly recommend this pattern!! As a fundraiser for our local Y, the Montessori classes helped stitch rows of trees, and each cild made 3 trees. We made 3 quilts! I'm slowly working through a box of fabric swatches my grandmother had to make one to keep. Thank you for the lovely pattern! 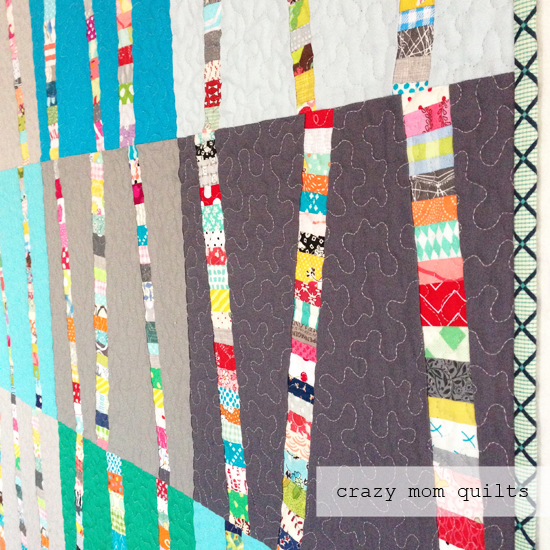 These birch tree quilts of yours sure are fun! I am very tempted to start collecting blocks of my own to try making this! What a great way to use up scraps! May I ask what your method was? Did you use any old scraps at all or did you try and stick with certain color ways or all brights? It really is fun. I have this pattern too. I am anxious to begin constructing the birches. I will have to purchase some solids.....one thing that is lacking in my really out of control stash. ps: I can't link up today. Am I too late because it is Sunday? WIP Wednesday-only 6 to go!